1924 he studied art at the Ecole des Beaux-Arts, Trieste. 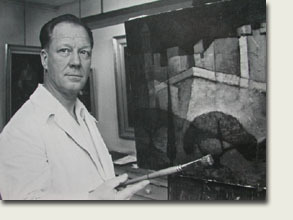 1928 he exhibited his paintings in Trieste and was promptly condemned by Mussolini's fascist regime. Two years later Toffoli emigrated to Paris and began regularly exhibiting at the Salon d'Automne, Salon des Independants, Salon des Peintres Temoins de leur Temps. 1939-1945 With the outbreak of the Second World War, Louis Toffoli sought refuge in the countryside of Touraine and worked for the French Resistance. 1947 After the war he returned to Paris and received his French citizenship. 1954 Toffoli's first published lithograph. During the following years he created many fine works of art in this medium, working mostly in the lithographic studios of Fernand Mourlot and Jean-Claude Perrin. Today the fine art of Louis Toffoli is included in public galleries in France, Holland, Spain, Portugal, Italy, Germany, Sweden, America and Israel. The largest collection of his art is located at Le Musee Toffoli, Charenton-le-Pont (near Paris). 1996 the Italian government decorated Toffoli with 'la Medaille de chevalier de l'ordre du Merite'. Scholars have pointed to semi-abstract, cubist and constructivist elements in Toffoli's art. The artist in fact claimed to be inspired by such Cubist explorers as Marcel Duchamp and Georges Braque. Yet, as one can see in Mother and Child, the gentle, masterful rhythms of color and form that Toffoli achieves sets his unique art apart from any school or movement.